If you’re new to MLB betting, you might find how odds are displayed and what your various betting options are confusing at first blush. We’re here to help you demystify some of the more puzzling parts of MLB betting. When you’re betting on the MLB, you’ve got a plethora of options available. These options include straight-up bets on which team will win the game, how much they’ll win by, how many runs will be scored, and other aspects of individual player performances, such as how many strikeouts a pitcher will have in a game. 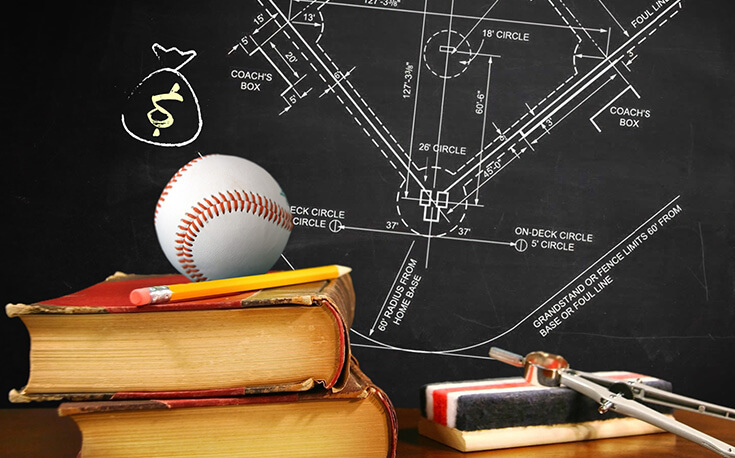 Read on for a crash course in how to read MLB betting lines and the types of bets available on baseball at online sportsbooks! What Does an MLB Baseball Line Look Like? First, let’s take a look at how sportsbooks post odds for upcoming baseball games. The image above shows odds for a Friday game between the Red Sox and Tigers. There are two listings for the same game. You can discern from the date, time, and teams that all the odds pertain to the same game. What Types of Wagers Can You Make on MLB Baseball? When you’re betting on baseball games, there are four main types of bets you can make: moneyline, run Llne, totals, and proposition (prop) bets. We’ll dive into each of them below. The word “spread,” located directly below the date/time, indicates that we’re dealing with spread betting. In other words, betting on the spread is when you bet on a team to win the game by a certain number of runs. This is also known as the “Run Line” when betting on baseball games. How many runs? It depends on which rectangular box you’re looking at. The top box has a spread of Detroit -1.5/Boston +1.5. The bottom box has a spread of Detroit -4.5/Boston +4.5. The team with the negative number next to its name is the favorite. The team with the positive number is the underdog. If you bet on Detroit using the odds on the top, the Tigers have to win by two runs or more in order for you to win your bet. If you bet on Detroit using the odds on the bottom, the Tigers have to win by five runs or more in order for you to win your bet. If you bet on Boston (using either set of odds), the Red Sox don`t have to win at all in order for you to win your bet. If you opt for Boston +1.5, then you will win as long as they don’t lose by two runs or more. “Why would I ever bet on the Tigers using the odds on the bottom?” you might now be thinking. There’s one very good reason: you can win more money. The three-digit number in parentheses after the spread indicates the payout. A positive number indicates how much you will win if you bet $100. A negative number indicates how much you have to bet in order to win $100. As such, if you bet $100 on the Tigers -1.5 (+170), you stand to win $170 in profit (i.e. you’ll get your original $100 back plus $170 more) if the Tigers win the game by two runs or more. If you bet $100 on the Tigers -4.5 (+550), you stand to win $550 in profit. It’s a lot less likely to happen, but if it does, you’ll be rewarded accordingly. If you bet on the Red Sox +1.5 (-215), you have to bet $215 in order to win $100. Some bettors, especially new ones, don`t want to worry about teams winning (or losing) by a certain number of runs. They just want to focus on who wins the game. That’s an option for MLB betting, too. It’s called the moneyline. Let’s look at another graphic. The odds in this graphic pertain to a game between the Giants and Padres. There are three sets of odds. We’re dealing with the middle one, the “moneyline.” The first, the “run line,” is the spread discussed above. The last, the “total,” (or the over/under) we’ll come to shortly. As you can see, both teams have a negative three-digit number next to their name. As with the spread, those three-digit negative numbers indicate how much you have to bet in order to win $100. But, because we’re dealing with the moneyline, you don’t have to worry about run-difference. If you bet on San Francisco -117, you’ll win your bet as long as the Giants win the game. Same for the Padres -103. The difference is that you don’t have to bet as much on the Padres in order to win $100. With some games, you might have a strong feeling that it will be high or low scoring, but don’t feel confident in who will win. Good news, there’s a betting option for these circumstances, too: the total! Also known as the “over/under,” the total is how many runs are expected to be scored in the game by both teams combined. In the graphic above, the total is 8.5. You can bet on the over or the under. If the game features nine runs or more, the over-bettors win. If the game features eight runs or fewer, the under-bettors win. Those familiar three-digit numbers pop up here again. The over (indicated by that lower case “o”) is at -115; the under (indicated by that lower case “u”) is at -105. As you already know, since it’s a negative number, it indicates how much you have to bet in order to win $100. Depending on what site you’re using and which game you’re looking at, there could be a slew of other items you can bet on. Time for another image! The top part of this graphic contains the now-familiar spread (a.k.a. run line), moneyline, and total for a game between Atlanta and Pittsburgh. The latter portion features a slew of props (short for “propositions”) you can bet on for the game, like whether it will go to extra innings, which starting pitcher will have more strikeouts, and which team will score first. The three-digit (sometimes four-digit!) numbers under the “odds” column indicate the payout for each proposition. If you successfully bet that the game will go to extra innings, you will win $700 on a $100 bet. If you successfully bet that the game will not go to extra innings (a much more likely scenario), you will only win $100 if you wagered $1,250. Again, depending on what sportsbook you’re at, you may have the option to limit any of the bets discussed above to just the first five innings of the game. In the graphic above, you would toggle between the full game and the first five innings by clicking “Game” or “1st 5 Innings” in the top red banner. Have you ever been watching a baseball game and noticed a palpable shift in momentum? Maybe the Yankees just tied the game with a three-run rally in the seventh, and are about to turn the ball over to their excellent bullpen. You might be sitting there thinking, “I wish I could go back in time and bet on the Yankees to win.” Well, you can’t go back in time, but you might still be able to bet on the Yankees to win thanks to in-game betting. It’s exactly what it sounds like: betting on a game that has already started. The types of bets you can make with live betting will be the same as the ones discussed above. But the odds will shift depending on the score and the stage of the game. You won’t be getting a handsome payout, and the juice (or vig) will be higher when you bet on the Yankees in the seventh inning when they’re up by four runs. Conversely, you can make a pretty penny wagering on comebacks. Unless you’re in-game betting, you will need to place your wager by a certain time in order for it to be accepted by the sportsbook. For baseball games, the cut-off time is the opening pitch. But keep in mind that broadcasts can be delayed, and sites can take a minute or two to process wagers. Best practice is to get your bet in at least a few minutes early. You might not have to worry about that, depending on what site you’re using. Many will refund your money/void the bet if one of the listed pitchers doesn’t start. Read the terms, conditions, and rules of all sites carefully before you start betting! Expand Your Sports Betting Knowledge Today! Looking to broaden your sports betting horizons? We’ve got you covered with our series on how to bet on sports!